What is an LED and how does it work? The polarity when connecting an LED is important! How is the series resistance of an LED calculated? LEDs save electricity, which is hardly something to shake and what everyone knows. However, they offer far more benefits. 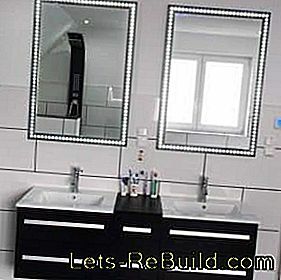 LEDs come out with a very low voltage and currentso that everyone can safely handle, taste, craft and decorate with them. With a few basic skills you can already create great decorations and lighting effects. Expertise in electrics or electronics is not necessary for this. A low heat output makes it possible to additionally use LEDs in areas. A special advantage is provided by RGB LEDs. 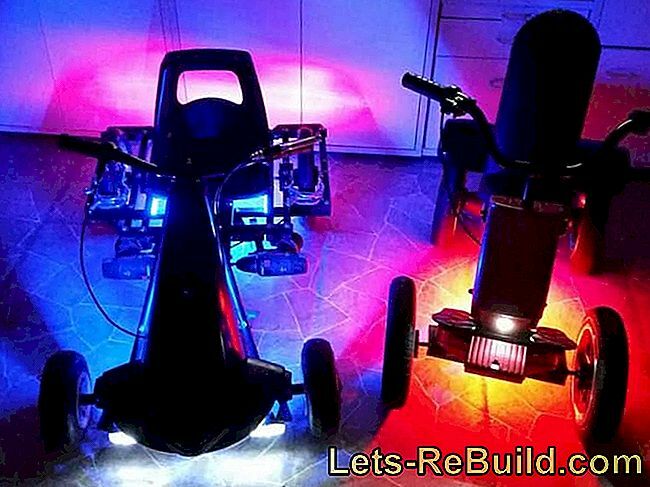 They are able to display different colors, so that even with an LED different colors can be displayed and mixed. 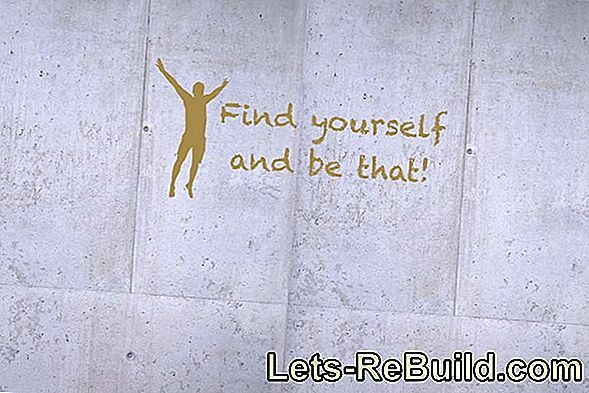 The field of application is unlimited, which many hobbyists show and bloggers prove in their projects. 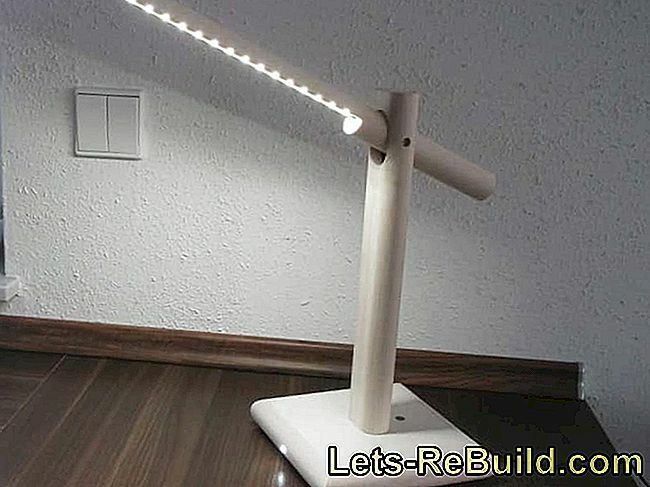 On this page we want provide basic knowledge, with which everyone should be able to implement small projects with LEDs. The abbreviation LED stands for light emitter diode (German: light emitting diode) or short light emitting diode. 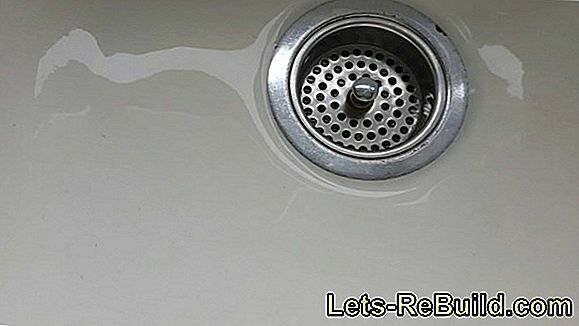 It is a semiconductor element so that it only lets the current flow in one direction. Therefore, always pay attention to the polarization of an LED. If even one LED is connected incorrectly in a row, it interrupts the circuit and is unable to light up. A light-emitting diode has two connections - the anode (positive pole) and the cathode (negative pole) - through which the current flows. Inside the LED is a semiconductor, usually made of a gallium compound, which converts the applied energy into light when electrons pass through. 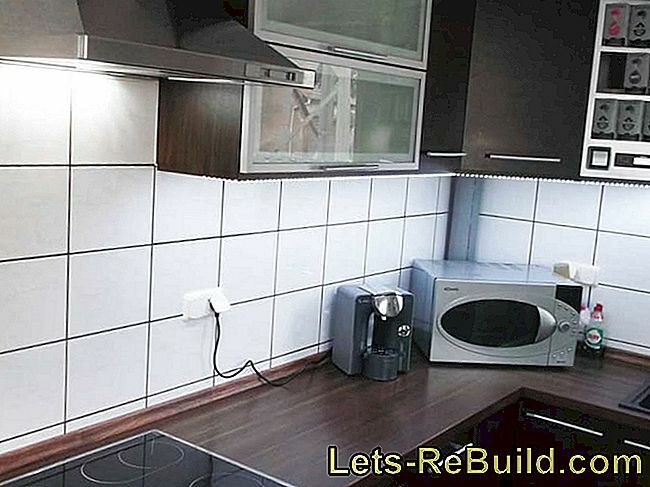 The design plays a minor role here. Light-emitting diodes are available in the well-known round shape, in different diameters, but also in functional and specific angular shapes. The luminous color is determined by the semiconductor element used and the band gap (transition of the electrons in the LED), with which all primary colors and also ultraviolet or infrared light can be generated. White light can be created by mixing several primary colors or by filtering blue light. Deeper knowledge is not necessary for the own handicrafts, because LEDs are offered in all colors and finished RGB LEDs can be mixed by cost-effective remote control in each color. Many supporters of LEDs as living room lighting complain that LED lamps have an unnatural light color. They hold on to old light bulbs because you do not want to give up the usual light. The color of the light is technically called color temperature and expressed in Kelvin. It ranges from 1000 K (red light) through yellow to blue with about 12000 K. The natural daylight is about 5000 to 5500 K and differs in this area between morning, noon and afternoon sun. However, the light of a normal light bulb is about 2700 K. and therefore appears yellowish. This area is called warm white because the light radiates a pleasant warmth. However, it can not be called natural light. Natural, on the other hand, produces neutral white light with about 3300 to 5000 K. It still has a slight yellow / reddish glow, but comes very close to the daylight. As daylight or kaltweis LEDs are designated from a color temperature from 5000 K. Here is the color perception between pure white at about 6500 K up to a cold blue at over 10000 K. So who would like to optimally represent the daylight, resorted to cold white LEDs, which according to investigations to increase productivity at work. Yellowish and warm white light radiates more of a cozy atmosphere and is therefore relaxing or even tiring. 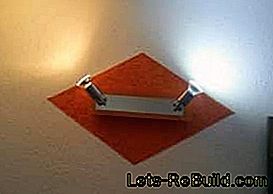 LEDs are available in all color temperatures and can therefore replace the usual light bulb without problems. However, if you want an absolutely exact exchange, you should only resort to branded products, as the specified color temperature can have different qualities and only the indication warm white already covers a large spectrum of a possible color appearance. Hard-defined is such a color specification for bulbs not. Reliable is only the exact indication of the color temperature in Kelvin. When connecting, always pay attention to the polarity of the LED. In almost all applications LEDs are operated with a 12 V power supply and additional series resistors. However, care should be taken when choosing the power supply. Not every 12V power supply unit will always supply 12V. Simple unstabilized power supplies will only reach approximately 12V under the indicated potential load. Without load, the voltage delivered can be a lot higher and even easily reach 16V. Since LEDs have only a very low load (current), they can be overwhelmed with the delivered 16 V quickly. While this does not automatically mean that they immediately burn through, too much stress will lead to increased wear, rapid loss of luminosity, and then to premature death. Light-emitting diodes may only be operated with a stabilized power supply unit. Stabilized power supplies compensate for different loads. Whether at idle or under maximum load, they always give the specified voltage. When overloaded, this can of course eventually fall off, which indeed reduces the brightness of the LEDs, but is not harmful or reduces the life expectancy of the LED. 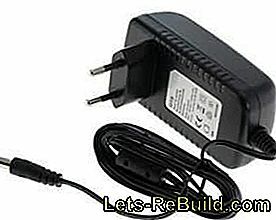 Stabilized power supplies cost little more than simple and many electronic power adapters are already stabilized today without special labeling. However, the use of old stocks should be avoided at all costs. Light-emitting diodes require only a very low voltage, which basically depends on the luminous color, but may be slightly different due to different qualities and production methods. 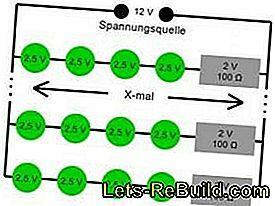 Operate LEDs with less than high voltage. A lower voltage reduces the luminosity, which can be compensated by increasing the number. On the other hand, too high a voltage leads to rapid wear and premature loss of the LED. The values ​​listed in the table form only a guideline. In principle, the LEDs should be used to judge the data sheet in which an optimum operating voltage is specified which forms an average value between a good luminous efficacy and an optimum service life. To obstruct LEDs according to their own ideas, it is necessary to know the characteristics of the used LEDs and the used power supply. This is the only way to calculate the correct series resistor of an LED. The following example shows how to calculate the series resistance of an LED. 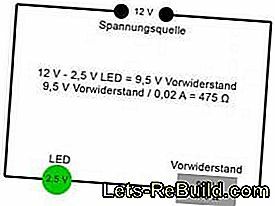 Starting with a 12V power supply and the basic rules in the simple circuit, the LED consumes 2.5V and the remaining 9.5V must be otherwise "disposed of". This disposal takes over the series resistor. The calculation (loss calculation) follows the simple formula R = U / I, which means: series resistor = voltage at the series resistor / used current of the LED. In the mentioned example this results in: series resistance = 9.5 V / 0.02 A = 475 Ω. Since not every value is available as a resistance, you should always resort to the next larger one. In the example this would be a resistor with 560 Ω. Instead of 20 mA, the LED receives 17 mA, which only minimally affects the luminosity, but increases the service life. Becomes a single LED connected to a 12V power supply, Of course, the series resistor must absorb a lot of voltage (power loss), which is converted into heat and thus lost. It makes more sense to connect so many LEDs in series that the series resistor can be as small as possible. The calculation is done in a similar way. 4 LEDs of 2.5 V each require a total of 10 V., so that the series resistor only 2 V remain. The current remains unaffected in a series connection at 20 mA or 0.02 A. 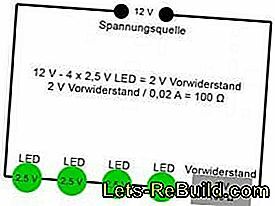 To use many more LEDs, a parallel connection of several such series (4 LEDs + 100 Ω series resistor) can take place. The series resistor is required in each individual row. The number of possible rows is limited by the power of the power supply, as the power consumption of the rows add up. If the power supply has a specified power of 600 mA, this results in a power (12 V x 0.6 A) of 7.2 W. An LED array (12 V x 0.02 A) requires 0.24 W. Therefore, On this power supply a total of 30 such rows are operated with four LEDs. This results in a stately number of 120 LEDs. The number of possible rows can also be calculated based on the specified power. If the power supply unit has 600 mA and requires a 20 mA LED array, the calculation 600 mA / 20 mA will result in 30 rows of four LEDs each. Of course, such a calculation should never assume the full load of the power supply. The indicated 600 mA refer in most cases to a peak and not to a continuous load. In order not to overwhelm the power supply, is for safety with 3/4 of the stated power calculated. This leaves about 450 mA, the 22 rows of four LEDs should operate easily. The required power supply should accordingly have at least a power of 1 A. Based on a power supply utilization of about 75%, a power supply with about 1.3 A would be necessary in order not to overload this in continuous operation. After all the theory and the necessary calculations, which can vary according to their own experience, since the ambient temperature can sometimes play a not insignificant role, of course, follows the actual crafting fun. There are no limits to the ideas and it is impossible to enumerate all application examples. 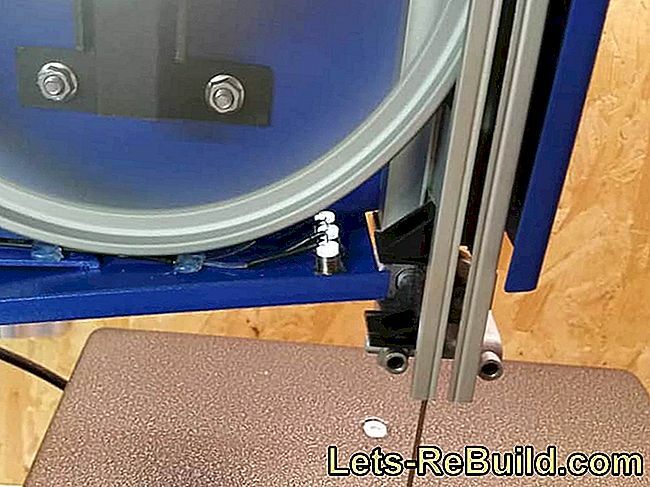 LED projects arise from decorative ideas, but also from a required lighting, as our example of a band saw shows. Awnings provide sun protection and relaxation on the balcony and terrace. 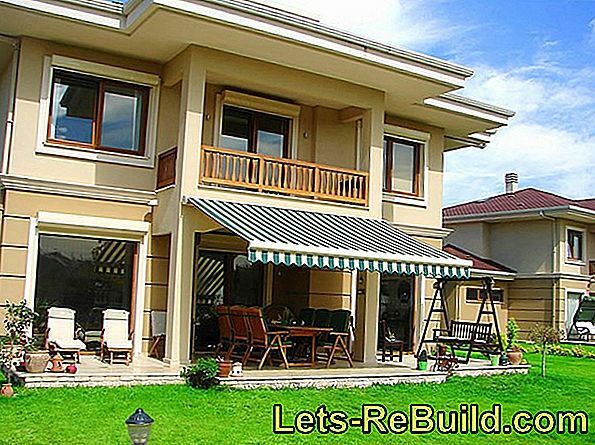 lets-rebuild.com will explain the most important quality criteria for awnings. 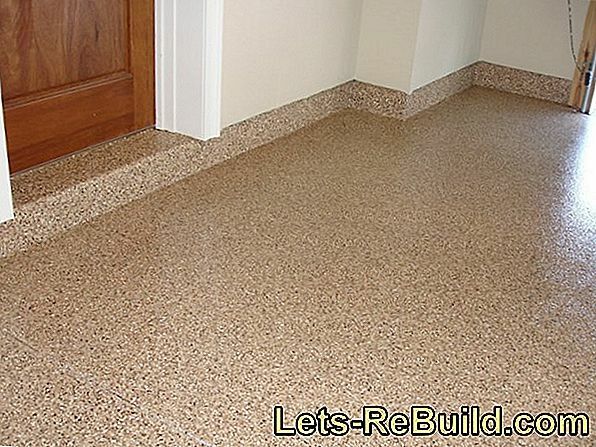 In compliance with our tips and with the right tools, every ambitious handyman can lay linoleum. 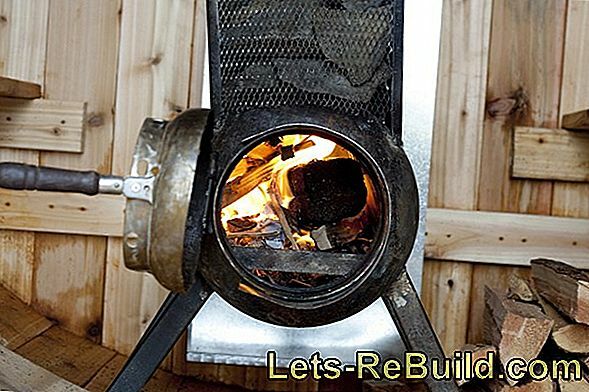 ➤ current electric fireplace comparison 2018 on lets-rebuild.com. 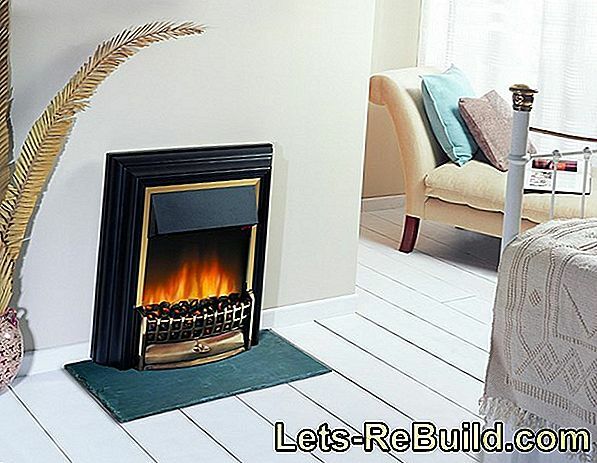 Compare now and order cheap electric fireplace! Improving the thermal insulation of a roof that has already been removed often means a lot of dirt and damage. 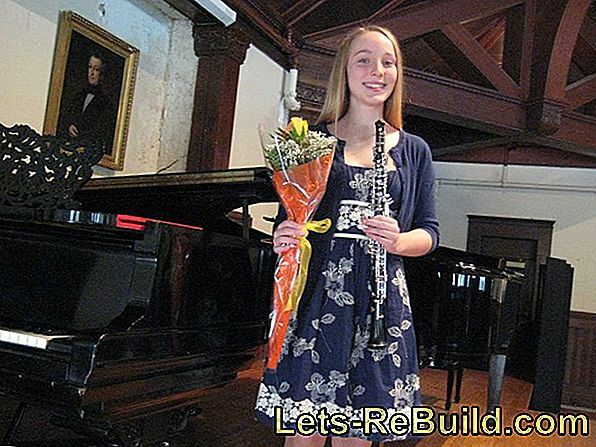 So you insulate from the outside with system components. 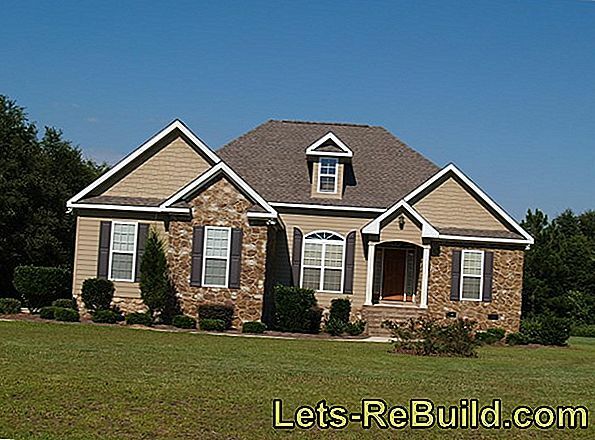 Brick walls are inherently resistant to insects or rot. Therefore, they do not need to be chemically protected for years. Non-woven wallpaper is increasingly used by home improvement, as it offers some advantages. 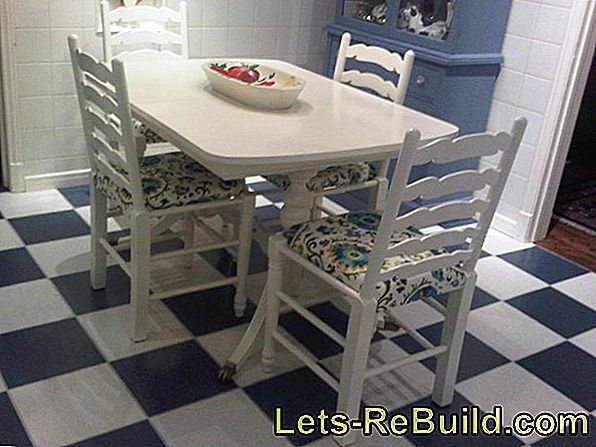 How to wallpaper non-woven wallpaper, you will learn in this guide. 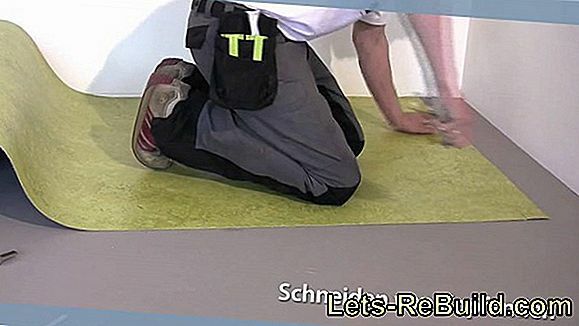 Lay the instructions for the laminate: prepare the floor step by step and lay click laminate. With tips for expansion joints and recesses. Windows installation: do-it-yourselfers can install new windows themselves. 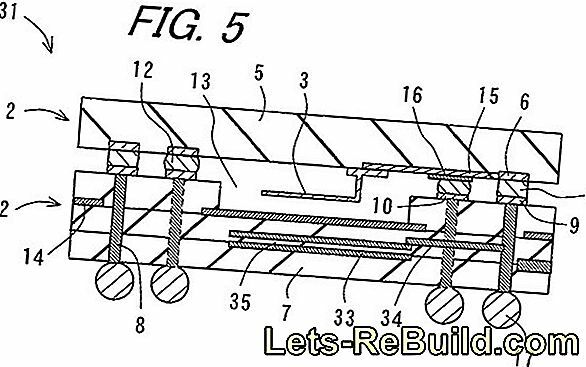 We have instructions for wood and plastic windows and a cost example for you.